Kim Kardashian is coming to video games. In exactly the manner you would expect. 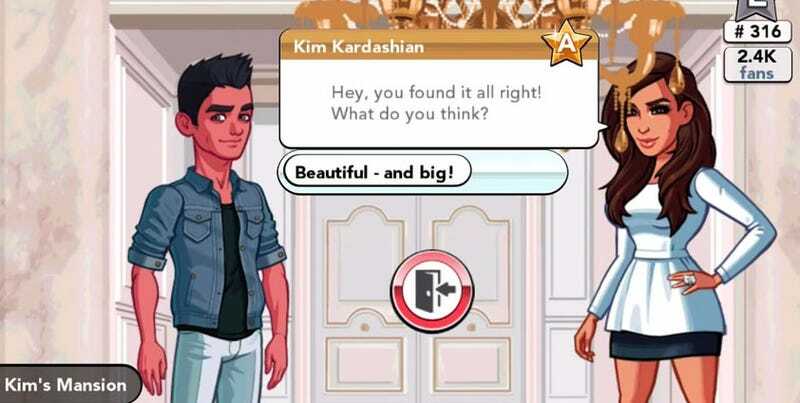 Kim Kardashian: Hollywood is on its way for iOS and Android. Note that the objective of the game is to "create your own aspiring celebrity and rise to fame and fortune". Why become famous for something you've actually done when you can just become famous? Various tabloid and entertainment sites are buzzing with teases and speculation about the game following a "reveal" on Kardashian's Facebook page, oblivious to the fact that there's already a lengthy playthrough of the game online. And by lengthy I mean over an hour. So, yeah, it you can dress up, go on dates, and do...stuff, with the opportunity to spend money at every turn. To all those hoping Kardashian's gaming debut would be a JRPG, I'm sorry.